North Sea, East Sheltland Basin. 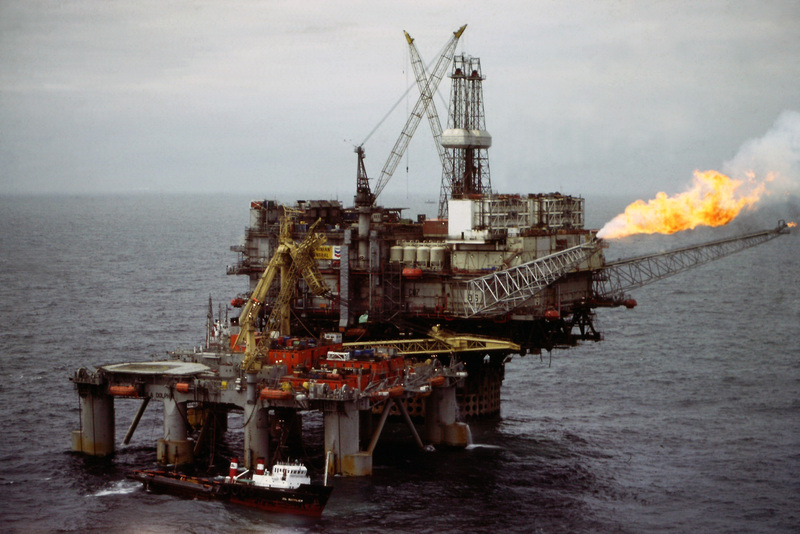 In the late 1970s I was an Air Traffic Controller on the North Sea Oil rigs in the Brent, Cormorant and Ninian Fields, collectively known as the East Shetland Basin. This gave me the opportunity to be able to take some aerial shots of my time out there. The photos were taken mainly from a Bolkow 105 helicopter operated by North Scottish Helicopters. The Bolkow was used as an in field bus on the Ninian. The Cormorant and Brent tended to operate Bell helicopters from the Treasure Finder. Left to right, rows top to bottom. 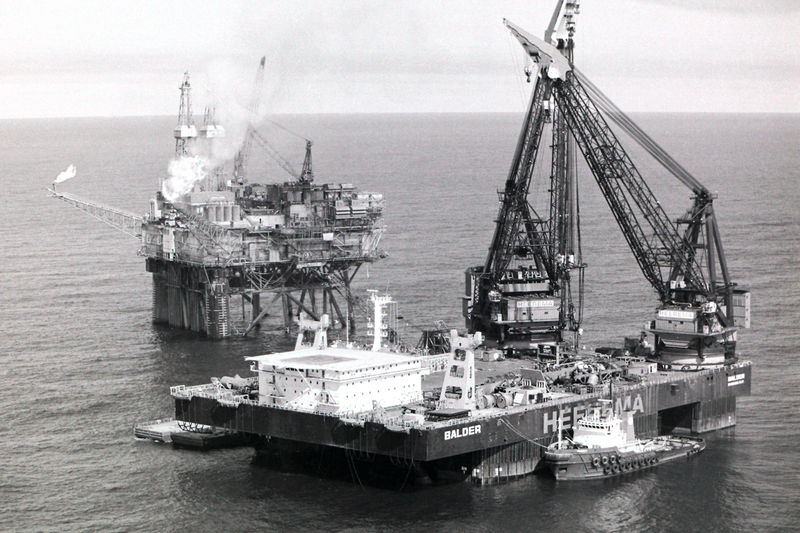 At the time the Heerema Balder was one of the biggest crane barges around. 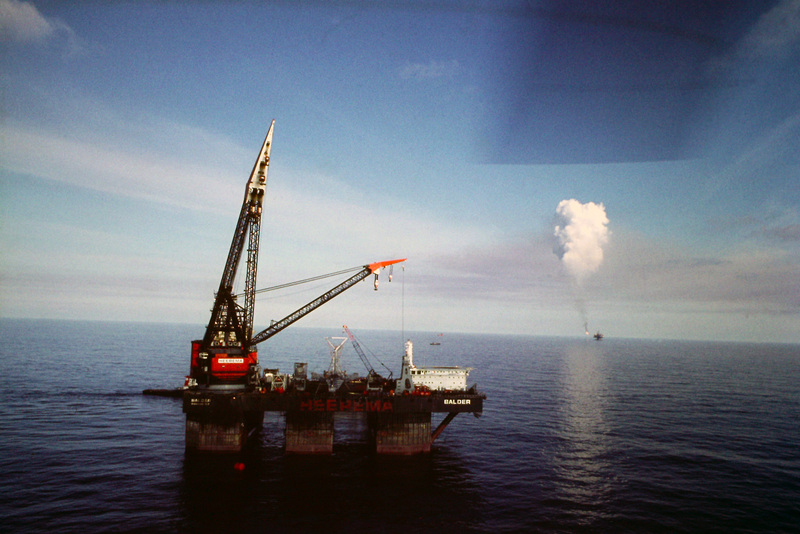 Behind her is the Ninian North jacket (can't be seen) and in the background Ninian Central Platform, the flare producing an infant pyrocumulus cloud. The dark blur in the sky is the helicopter rotor. The Balder was postioning to lift the platform onto the jacket (legs). Sedco 707. 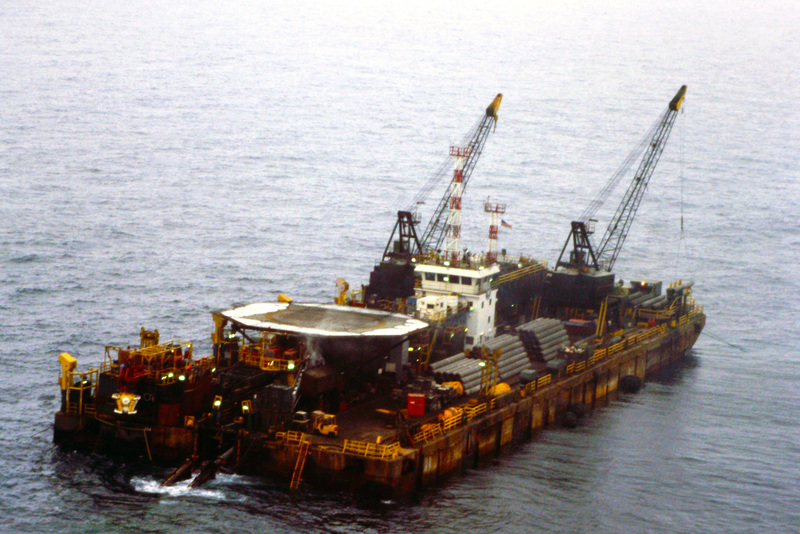 This is a pipe laying barge powered by a Boeing 707 engine. The pipes by the cranes are lifted into place on the deck and are then continuously welded and being forced out the other end, you can see the pipe falling into the water. Ninian Central Platform with the submarine/survey ship, The Star Canopus. Ninian South Platform with an accommodation barge (semi submersible) alongside. Any large additional work on the platform requiring increased manpower also required more bed space! 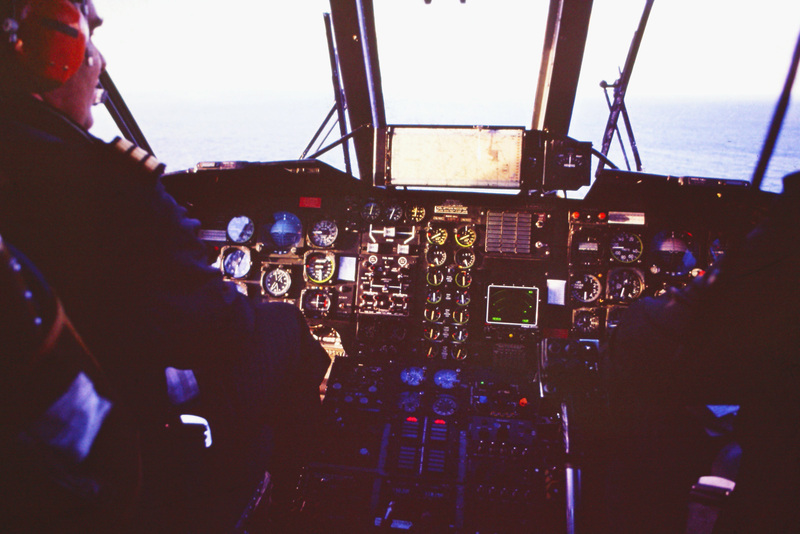 S61 (Sea King) flight deck, unlike a fixed wing the Capt sits in the right seat. The chart in the centre of the screen is the Decca Navigator. This was the only visual positioning nav aid, it suffered from latency and therefore not very accurate but it worked. No GPS in them days!! Ninian Central with the semi sub The Borgela Dolphin. Again this was used as an additional accommodation unit when major works were being carried out. Here they were preparing to add additional steelwork to the platform to accept gas compression units. Ninian Central Flare. 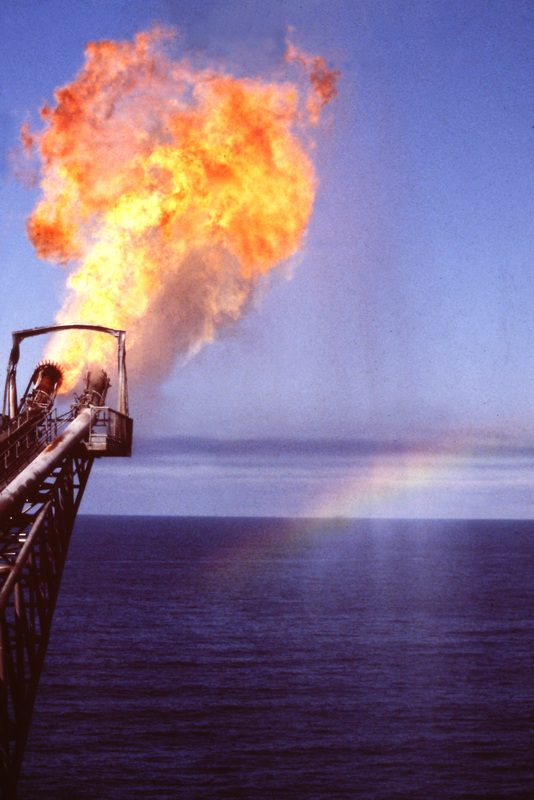 In certain light conditions a rainbow was produced by the sea water being used to cool the tip of the flare. You can see the "crown" through which the water came from. 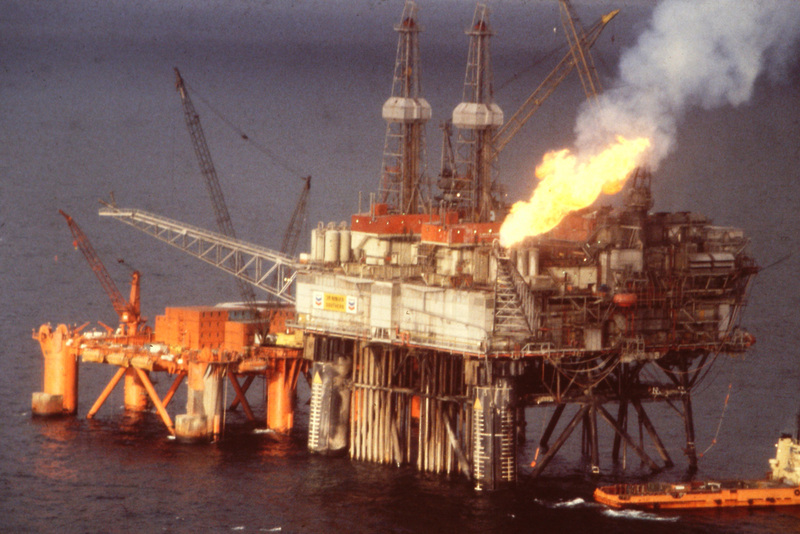 In the early days of production the natural gas associated with the crude oil was burnt. Later methods were devised to clean and compress the gas and send it back down the well. As Air Traffic Controllers we also did the met reports, quite often when wanting to report "CAVOK" (sky clear of cloud) we couldn't because the flare also turned the sea water into water vapour. As this rose it naturally cooled and became water again. Finally as the column gained height it produced what is known as a pyrocumulus cloud, a cloud produced by fire. Occasionally it would rain downwind of the cloud. 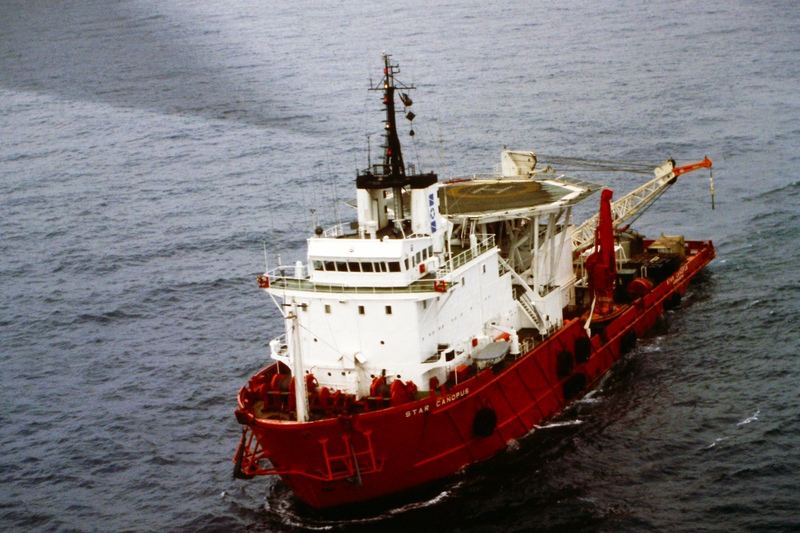 Survey/Dive ship Star Canopus on station at Ninian Central. 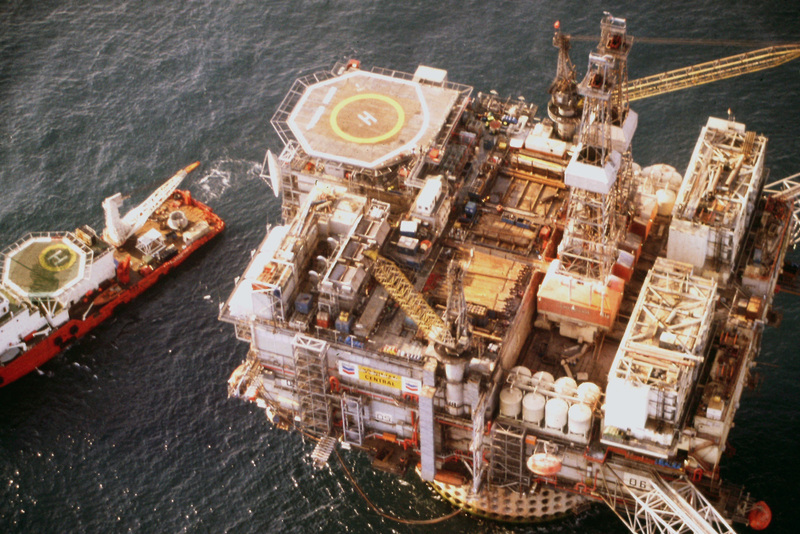 Heerema Balder & Ninian South Platform.